The world’s obsession with physical beauty has gone to whole new level in 2016. Each and every year, there are at least 47 million procedures that are done around the world. The numbers are only expected to rise each year as more and more men and women discover the quick and easy way to change their lives through plastic surgeries. There are several reasons why people have cosmetic surgeries done, some do it for plain vanity, to contribute to their self esteem. Others do it to correct deformities on their body while others need it for health reasons. Number 7 Most Popular – Breast lifts or Mastopexy -Aptly named, breast lift augmentation procedure is for when gravity takes over and breasts sag. This is for people who have gained weight, lost weight or after pregnancy. It restores breast to its natural higher position. The surgery can be done in a day and the recovery depends on the person. You can expect to feel pain for 48 hours. It would take at least two weeks for a person to resume physical activities like moderate exercises. Number 6th Most Popular – Face lifts – If there is a procedure to lift the breast, then it is only logical that there’s also a procedure to lift the sagging skin in the neck and face. A surgical rhytidectomy or non-surgical stem cell face lift procedure can help stretch the skin up, giving it a tighter, smoother look. There will be bruises and scarring so people who get a face lift normally stay in for the first week. The recovery period will sometimes take as long as 3 weeks. Number 5 Most Popular Surgery – Tummy Tucks – This procedure is done to flatten the abdomen and tighten the abdominal muscles. It is perfect for people with saggy skin or excess fat along the middle. Not to be confused with liposuction, this surgery doesn’t involve sucking the fat out of the belly. The surgery can be done within one to five hours, depending on the person’s fats. Mini and Full Tummy tucks will require 10-14 nights in Bangkok or Phuket and full healing will take around 6 weeks to return back to daily life, a full body rest for weeks will be necessary to recover. The 4th Most Popular – Eyelid surgery or Bleph – This is perfect for people who always complain about having eye bags or always looking tired. 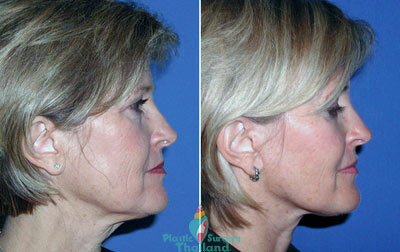 An eyelid surgery will help look rejuvenated by removing the fat that appears underneath the eyes. 7-10 days is usually enough time for recovery, the tiny scar from the surgery will be visible for at least 4 to 6 weeks but it can easily be covered by makeup.